It’s been a whirlwind couple of weeks with exciting city and county-wide developments. Ironically, just as President Trump was threatening to shut down the U.S.-Mexico border, I flew to Mexico City with a binational delegation organized by the San Diego Chamber of Commerce to focus on strengthening our relationship with our southern neighbors. We’ll get to the Mexico trip in a moment, but first I want to tell you about a great development in Encinitas’ largest current project. What happened: An inter-agency dispute threatened to cause a protracted, project-delaying stalemate for the city’s largest capital improvement project. But – drum roll, please – we reached a compromise plan! A personal observation: the longer I serve in public office, the more I see inter-agency disagreement as the norm. Each organization has its own perspective and priorities, meaning a smooth ride isn’t guaranteed. What’s the project? : Leucadia Streetscape will enhance downtown Leucadia as a community gathering place instead of a cut-through to avoid heavy traffic on I-5. The project has been in the pipeline for more than ten years and has broad support. The overhaul will widen sidewalks, reduce traffic lanes, add parking and roundabouts, and create dedicated biking and walking space. There is an opposition group, as I’ve found there to be with nearly every major city project. The process can be messy and contentious, but the good news is that everyone has a voice and our democracy hopefully sorts it all out. Another personal observation: it still pains me every time we’re unable to find a path forward that everyone can agree on. How we got back on track: In a word, teamwork. Councilmember Tony Kranz is the chair of the railroad agency, NCTD, and I’m the vice-chair of SANDAG, the county’s transportation agency. 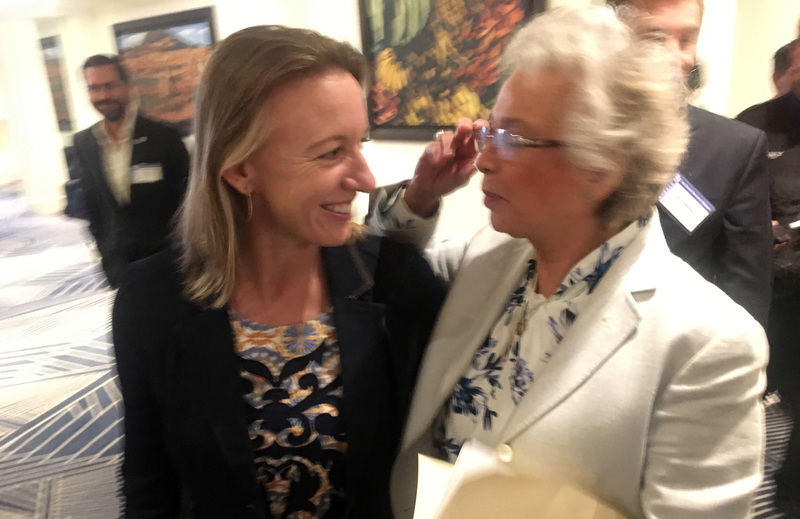 Plus, our newest Councilmember Kellie Shay Hinze has a deep understanding of the Streetscape project, and is passionately committed to it. 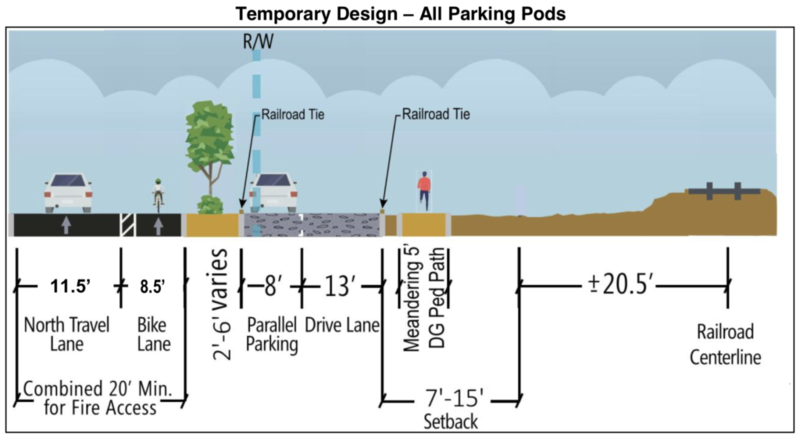 At a Council meeting, Kellie suggested that we make certain parts of our Streetscape plan temporary, specifically the parking lots in the rail corridor. That would allow future decisions about the rail corridor to be considered by other agencies, but it wouldn’t hold up our plan. You can see the idea for northbound traffic as it was presented and approved above. The “drive lane” is a parking assist lane so that those parking aren’t in traffic or stopped in the bike lane. 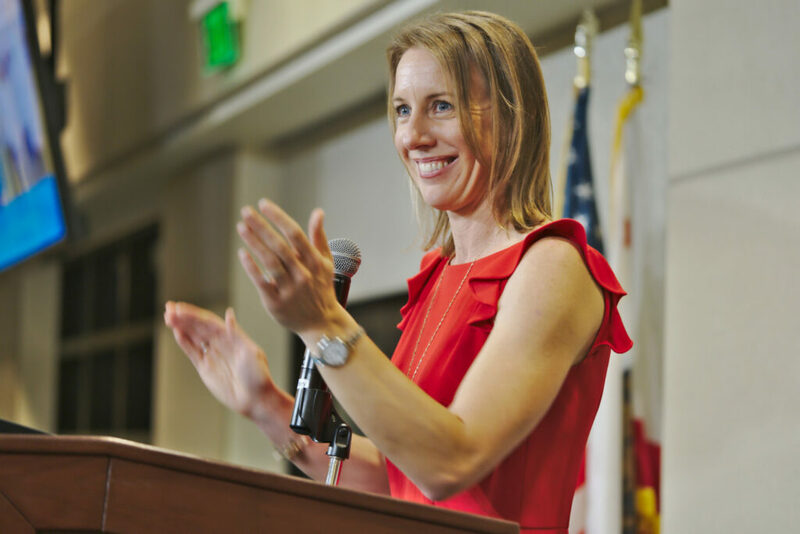 At SANDAG we have a new, can-do executive director whose approach aligns with the goals of this project. We also have a team of dedicated staff members at all three agencies who have redesigned parts of the project multiple times, offered creative solutions, and simply kept after it. In the end, it came down to relationships, expertise, leadership and the commitment of those involved – teamwork. Here’s the San Diego Union-Tribune/Encinitas Advocate article, and this is the story from the Coast News. Despite the rhetoric at the top of our national government, the binational delegation that I joined last week to Mexico City was very successful. Among other things, we were promoting priority border projects such as a wastewater facility near the border to treat and process the raw sewage from the Tijuana River Valley that pours into our ocean waters, fouling local beaches. Some of the beaches around Imperial Beach are closed because of the contamination for more than half the year. This is an unacceptable situation that has persisted for far too long. We all need to support a binational solution to the problem. The woman with me in the top photo is Olga Sánchez-Cordero, Secretary of Gobernación, equivalent to the U.S. vice president. When the President of Mexico is out of the country or sick, the Secretary of Gobernación is in charge. She is also a retired Mexican Supreme Court Justice. 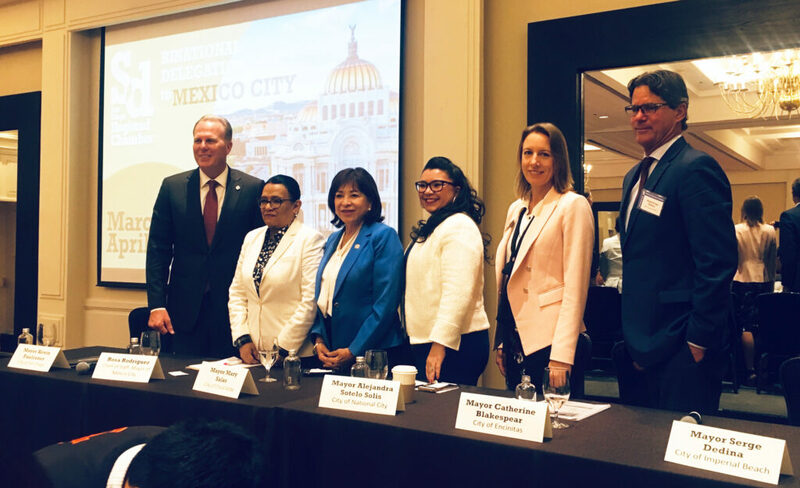 Along with advocacy meetings, I was part of a panel and a press conference expressing priorities from the mayoral perspective – you can see our delegation of San Diego County mayors in the middle photo above, along with the chief of staff to Mexico City’s mayor. And all 100 of us are in the bottom photo, with elected officials in the front row. In coordination with the Chamber effort, the SANDAG team, including our Executive Director Hasan Ikhrata, me and others, met with representatives from both governments about construction of a new border crossing for goods and people, known as Otay Mesa east. The U.S. has already spent close to $500 million on the road construction, right-of-way acquisition, utility relocation and more. With a new government in Mexico, it’s important to keep this border crossing project a top priority. Here’s a very informative short video about the need for this new crossing. In Encinitas, about 13% of our 65,000 residents are Hispanic. The cross-border relationships – family, jobs and commerce – affect all of us for the better. We live in a thriving, intertwined binational region and we need to all work to further strengthen it. Did you know that of the five county congressional districts in San Diego County, ours, the 49th, is the second largest exporter to Mexico? The top two categories our district exports to Mexico are audio/visual equipment and communications equipment. Here’s an article in the Times of San Diego about our mayors’ message to Congress, urging them to ratify the NAFTA replacement called the USMCA (United States-Mexico-Canada Agreement). 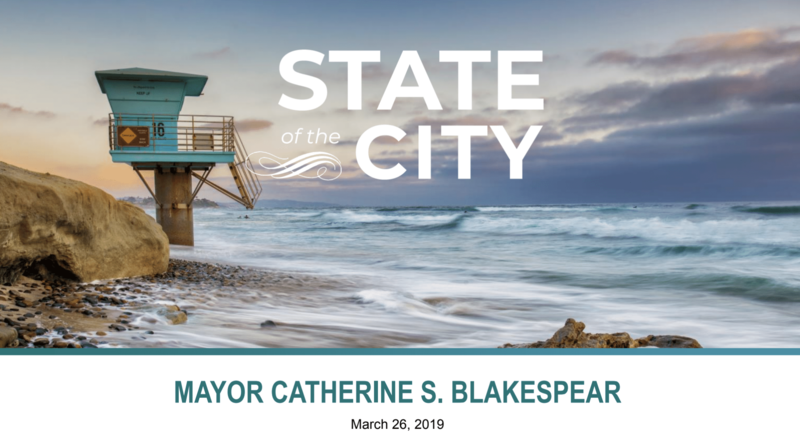 Our State of the City event was a glowing evening, filled with good cheer and recognition of the accomplishments and paths ahead. You can watch the hour-long video of the entire event, or skip to 30 minutes in to see my 20-minute description of what we’re up to in the city. The San Diego Union-Tribune story on my address is here. Encinitas is in a great place as we’ve finally moved beyond the strife associated with our current housing cycle and we’re beginning the implementation of our city’s top infrastructure project, Leucadia Streetscape. I’m truly excited about what the future holds for Encinitas. Thank you for being a part of it!